In the speech-therapy department, therapy and restoration of speech and communication disorders is being provided. In this department, the children are being treated in individual sessions. 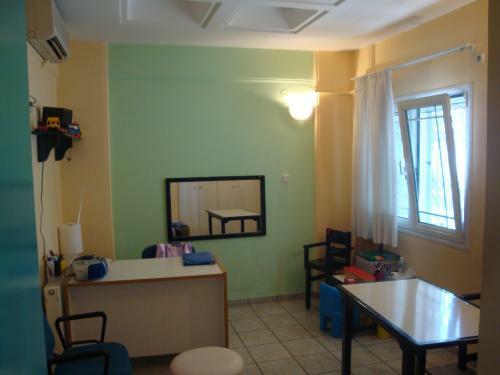 The Speech Therapy Room, in Efthimio Centre. Every therapeutic program includes the collaboration of the therapist with the family, and depends on the child's age, the kind and the degree of the problem. This way, the child is provided with a safe and accepting therapeutic environment. The science of speech-therapy deals with speech, voice, talking and feeding disorders, regardless of their cause (neurological, evolutionary or functional). The on-time finding of the problem, given that it often occurs in a small age, has a defining impact on its treatment , along with the family’s active participation. The speech therapist in the Efthimeio Centre treats the child on individual sessions, aiming at the evaluation and reinforcement of its competences, and in the same time tries to eliminate the worsening of any malfunctions.